To answer this listener question, Brave Little State surveys the struggles, and the potential fixes, when it comes to housing pressures in Vermont. That’s the question that Peter Kerson put to Brave Little State, VPR’s people-powered journalism project. Every month we answer a question about Vermont that’s been submitted and voted on by you, our audience. Note: Our show is made for the ear. If you are able, we strongly recommend listening to the audio above! Our brave question-asker this month is Peter Kerson, originally from Middlesex, Vt. He now lives in Virginia, but he and his wife are on the market for a house here. Peter says he and his wife want to live somewhere on the I-89 corridor: Norwich, Montpelier, Waterbury. In terms of price, they can go up into the $300,000 range — but Peter says most of what they’re finding is pretty old, from the 1800s and early 1900s. And a lot of it is not in great shape. Peter says he’s been hearing about the housing crunch “forever,” and he’s wondering why it’s not getting any better. So he came to us. Taryn Haas knows about “those older houses” that Peter is seeing for sale in Vermont. She has her sights set on a home that was built in 1911, in Barre. It’s white with green trim, in a quiet neighborhood on a hill above Main Street. It’s a Monday afternoon, and Taryn is standing outside, waiting for her realtor anand an inspector to show up, for a routine property inspection. Taryn has this house under contract, to buy it as-is, for about $90,000. That’s quite affordable, as far as Vermont prices go. But it’s still a stretch for Taryn. She’s 29, and she’s got student debt and credit card debt. Taryn works in insurance the next town over, in Montpelier. And the reason she’s trying to buy is that she and her partner aren’t super psyched about renting. For one, they aren’t able to save much. Taryn’s realtor eventually shows up, along with the inspector, a man named Joby McDonald. Inside the house, Joby gets to work testing the kitchen systems — the dishwater won’t start, as the water supply appears to be off — and trying to diagnose a loud hum, likely from the heating system, that was not humming at Taryn’s showing. Then it’s down to the basement. Joby points out some antiquated or otherwise questionable electrical wiring, some aging plumbing and some signs of water damage. “Most of the stuff that we’re talking about so far is exactly what I would expect to see in a house built in the early 1900s,” he says, noting some small cracks in the foundation that he says don’t “overly concern” him. Joby McDonald, right, talks buyer Taryn Haas through a home inspection for a 1911 house that Haas has under contract in Barre. “We can see that there is some still what my grandfather called snake-skin, or you know, the original cloth-skin romex,” he says, gesturing to some electrical work. For her part, Taryn seems to be getting a little nervous. It’s not like this will be an impulse buy for Taryn. She’s done her research and compared prices. She really, really wants to take this step. But it doesn’t seem like she’s on solid ground. This of course has everything to do with Peter’s question, about the limited options that buyers feel like they have in this state. To answer Peter’s question, we first need to answer a different question: Is there actually a housing crunch in Vermont? To try to figure that out, we spoke with Michael Moser, the coordinator for the Vermont State Data Center. Moser’s been on Brave Little State before. 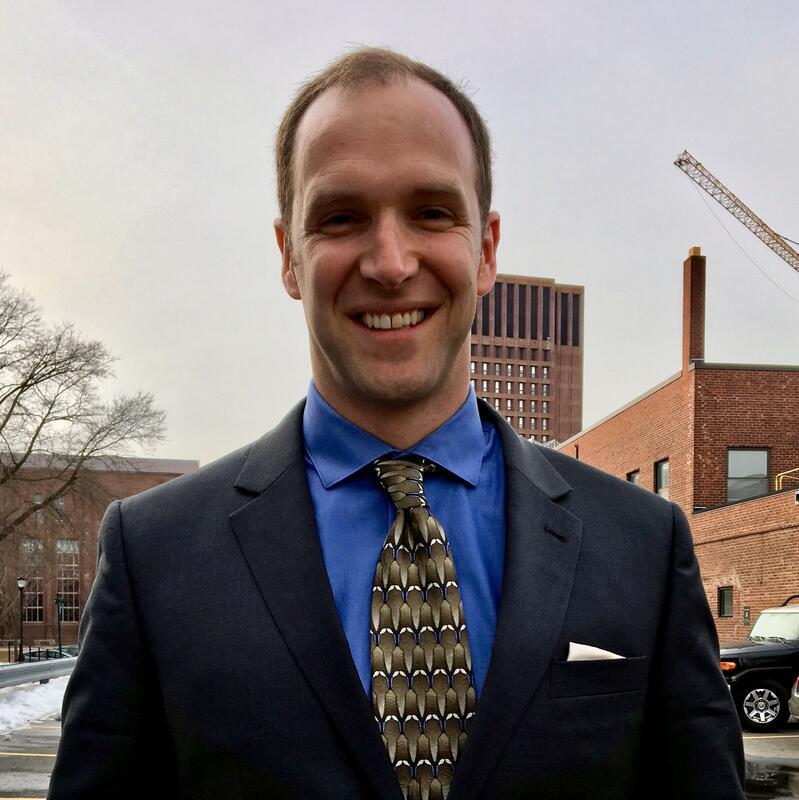 He mostly works with data from the U.S. Census Bureau to get a detailed picture of the people and economy of Vermont. When we reached out to him for this episode, he very kindly compiled some recent data about Vermont’s housing market. The numbers come from two different five-year American Community Surveys, conducted by the Census Bureau between 2006 and 2017. Does Moser think Vermont has a housing crunch? Well, let’s break that down a bit. First, between the two surveys, the number of housing units in Vermont went up. “Yeah, a 3.7 percent increase in the total number of housing units between those two time periods,” Moser says. More housing. Judging just by that number, there's not much of a crunch. But of course there's more to the story — Moser notes that 26.7 percent of Vermont’s housing stock is 80 years of age or older. That means our question-asker Peter's observation is pretty spot on: a quarter of Vermont's housing is old. That’s more than double the national average. 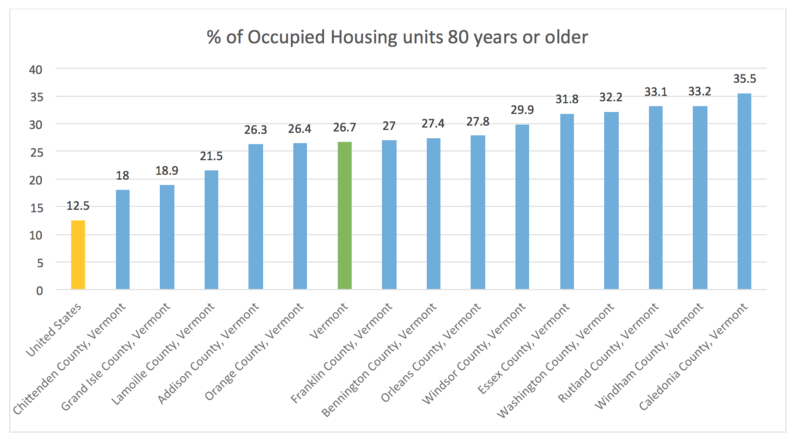 A quarter of Vermont's housing, more than double the national average, is 80 years or older. Another measure? The vacancy rate. Most vacant houses in Vermont are seasonal and recreational homes, and the vacancy rate is pretty uneven across the state. For example, nearly 47 percent of homes are vacant in Essex County, in the very northeast of the Northeast Kingdom. But just 5 percent are empty in Chittenden County. Most vacant houses in Vermont are seasonal and recreational homes, and the vacancy rate is uneven across the state. Case in point: When we put a call out for stories of people looking for houses and apartments in Vermont, we heard from someone who was having a really positive experience in Rutland County. So, maybe this state doesn't have a housing crunch across the board. But talk to housing experts in the state, and you’ll get a different answer. “I do think that we have a housing crisis in the state. And so I think that we need all hands on deck,” says Maura Collins, head of the Vermont Housing Finance Agency. The agency finances and promotes affordable housing for low- and moderate-income Vermonters. Collins says the so-called “housing crunch” comes down to one central issue: affordability. Maura Collins, head of the Vermont Housing Finance Agency, says household incomes in Vermont haven't kept up with home prices. “There is a joke that all the housing in Vermont is affordable if you were someone who was super rich,” she says. Collins says the real crunch is around housing for those who aren’t in that upper echelon. “Why isn't housing affordable for more of us who earn moderate — sometimes even good — incomes, and we still can't buy a home and afford our home?” Collins muses. One reason for that? Collins says household incomes in Vermont have been pretty much stagnant for years. “They're not moving up as fast or as high as housing prices have,” she says. According to Census data compiled by VHFA, 36 percent of all Vermonters are cost-burdened. And when you break that down a bit, 30 percent of homeowners and 51 percent of renters are burdened by housing costs. So how can Vermont change that? “By building more housing that would be affordable to more people,” Collins says. Building more housing. We’ll look into some of the tensions around that issue in a bit. Collins says new construction is especially needed in some parts of the state: the White River Junction area, Montpelier, Chittenden County. And there’s another divide. In some areas, the need is new construction. In others, it’s rehabilitation. But wherever you are in the state, there is still plenty of demand for decent housing. That demand plays out in different ways. In Burlington, Vermont’s queen city, it puts big pressure on the rental market. Marilyn Tagliavia knows something about that. Marilyn and her boyfriend live in the city’s Old North End on the second floor of a duplex. It was built in 1900, according to city records. It’s a nice two-bedroom place, but it has its quirks. “When we first moved in here, the pipes broke under the kitchen and all of the water rushed under the stove,” Marilyn says, laughing, as she points out the slanting floors. These kinds of oddities might be familiar to anyone who’s rented in one of Burlington’s many older properties. And the kitchen’s not the only room in Marilyn’s apartment with some less-than-ideal qualities. The bathroom is tiny, and the bedroom has a slant of its own. “We kind of got used to sleeping on a slant here,” Marilyn jokes. Not long after they moved in, Marilyn and her boyfriend knew they wanted to find a better place. So in order to land a new apartment for this coming June, a co-worker of her’s recommended they start looking in October. “I understand planning in advance, but the prior year planning is — [it] seems a little bit excessive,” Marilyn says. But their early start paid off. They found their new place just a block away. She walked Brave Little State over to see her future home. The grey, boxy, structure was built in 2015. There’s parking, better heat, flat floors — all things Marilyn likes. But it does come at a steeper price. “I think it’s $1,470 a month, and right now we’re paying $1,330,” Marilyn says. But, totally worth it, she says. Just a note: The median rent in Vermont, according to the latest U.S. Census survey, is $945 a month. It’s widely known that Burlington is expensive — and it’s desirable, according to Sandy Wynne. She’s been a realtor in the area since the early ‘80s. On a snowy February day, she takes Brave Little State’s Henry Epp on a sort of real estate tour of the city. Something you should know about Sandy Wynne: She is a major booster of Burlington. Not in any official capacity, but she loves the place. She has something positive to say about pretty much every corner of the city. Burlington realtor Sandy Wynne is an unofficial booster for the community, and has something positive to say about almost every corner of Vermont's queen city. Sandy drives along Riverside Avenue, above the Intervale area, and praises it as another unique part of Burlington. As she drives, Sandy can’t really help but slip into realtor mode. A little way down Riverside, she turns into a winding drive up to a newer condo development. At this point in the tour, Sandy has asked the right questions to know that Henry is a renter, in his late twenties, likely to stay in Vermont for the foreseeable future. So how common is it to find something like that these days? “On a regular basis one or two come up, but you just don’t get a lot,” Sandy says. For the record: Henry did not buy that condo. But as of this publication, a sale is pending on the unit, according to its online listing. Some important context here: Vermont isn’t the only place with a tight housing market. “It is across actually the United States at this point,” says Debbie Jensen. She’s president of the Vermont Association of Realtors, and currently works for eXp Realty. We called Jensen up to try to figure out what’s unique about Vermont’s crunch. We talked to Jensen on Feb. 25. She said in the seven days prior, there’d been 64 new listings in those three counties. Millenials like Taryn. She’s the buyer we met earlier, with a budget of $90,000. Jensen explained the way that higher prices can have a ripple effect through the market. Take seniors, a demographic that’s growing in Vermont. They’re looking to downsize. Jensen says she is seeing these prices for condos in Chittenden and Franklin counties. And she says that’s leading more seniors to stay put, rather than sell their larger homes to, say, young families. Meanwhile, young people who have started out in a condo? It’s hard for them to upgrade, so they’re not selling either. And that leaves buyers like Taryn with very few options. We checked in with Taryn a few days after her inspection for that house in Barre, to find out how it all wrapped up. The other half of the roof was shot — Joby said Taryn would be lucky to get a year out of it. So that’s the bad news. The good news is that Taryn negotiated $10,000 off the sale price. Taryn’s closing is later this month. So, why hasn’t the market provided those mid-range properties that buyers like Taryn, or our question-asker Peter, are after? “Part of it is that the fundamental cost of producing housing in Vermont is relatively high,” Hoekstra says. There are several things driving up our prices, according to Hoekstra. Three, we’ve got a labor shortage in the construction industry, like many other places. And then there’s permitting. “So, a lot of people will talk about the regulatory environment in Vermont, our permitting system — Act 250, and local zoning ordinances and things like that,” Hoekstra says. He notes that this part of the process doesn’t necessarily skyrocket costs, but can be time-consuming and add a lot of risk. A symphony, so to speak, that results in pricey housing. Erik Hoekstra says Redstone projects cost about $250,000 per apartment. And in the for-profit world, in the absence of things like subsidies, those costs inevitably get passed on to customers. Hoekstra mentioned Act 250. If you’re not familiar, it’s Vermont’s land use and development law, which reviews projects over a certain size. And if its critics say it slows development, proponents — well, they say it slows development. “Yeah, we don’t get a lot of speculative housing built,” says Rep. Amy Sheldon, who represents Middlebury in the Vermont House. She also chaired the Commission on Act 250, which recently put out a big report on the law. And when it comes to affordable housing, Sheldon says Act 250 has actually bolstered certain types of projects. Sheldon offers her own theory: the second home phenomenon. She says she’s noticed it in her own community, in East Middlebury. According to the latest Census, 15.6 percent of Vermont’s homes are “for seasonal, recreational, or occasional use." Then you’ve got the the Airbnb phenomenon, with houses being used for short-term rentals. But back to Act 250. When they wrote their big report, Amy Sheldon’s commission made a bunch of recommendations for the law moving forward. The big focus is actually on mitigating the effects of climate change, but there’s also a move to funnel more development into downtowns. “We are looking at an enhanced designation process for our downtown areas,” Sheldon says. Kind of complicated, but the idea is to encourage higher-density building while protecting working landscapes and natural resources. “Density” is actually a word that we heard a lot while working on this episode. It’s something many state housing experts point to as a solution, if not the solution, to Vermont’s housing woes. In Chittenden County, denser private development has started to ramp up in response to that pent-up demand for rental housing we heard about earlier. In 2016, a bunch of regional planners, advocates, developers and government leaders all signed on to a five-year goal: build 3,500 new housing units in the county, 700 of which should be designated as affordable. “The fact that we all agree on the problem means I think it’s simpler to get to the solution,” says Chris Donnelly, with the Champlain Housing Trust, which manages and advocates for affordable housing. So, a bit of a mixed bag. But it’s not the only recent big effort to build more affordable housing in Vermont. In 2017, the state set up a $37 million bond aimed at building about 600 new affordable housing units. Donnelly argues much more is needed, and that the state has been underinvesting in housing for years. But at this very moment, there’s an effort in the Legislature to issue another big housing bond, though it’s not clear whether that will move forward. Further south in the state, in White River Junction, there’s a new high-density project in the works. Wentworth Community Housing, on Sykes Mountain Avenue, will contain 30 units of multi-family housing. Andrew Winter, the executive director of Twin Pines Housing, a nonprofit developer of affordable housing in the Upper Valley, showed Brave Little State around the job site on a recent snowy morning. Wentworth Community Housing, on Sykes Mountain Avenue in White River Junction, will contain 30 units of multi-family housing, with some unique income eligibility. He led the way into the modernist four-story building — three floors of housing above a parking garage. And as soon as you step into one of the units, you notice how warm it is. “It’s very well insulated, and a lot of time and effort has been spent in ensuring that we minimize the energy loss in the building,” Winter says. These units will be very energy efficient, which Winter says will result in lower costs for tenants. And these units are going to be more affordable for more kinds of renters — namely renters who wouldn’t normally be eligible for housing like this. 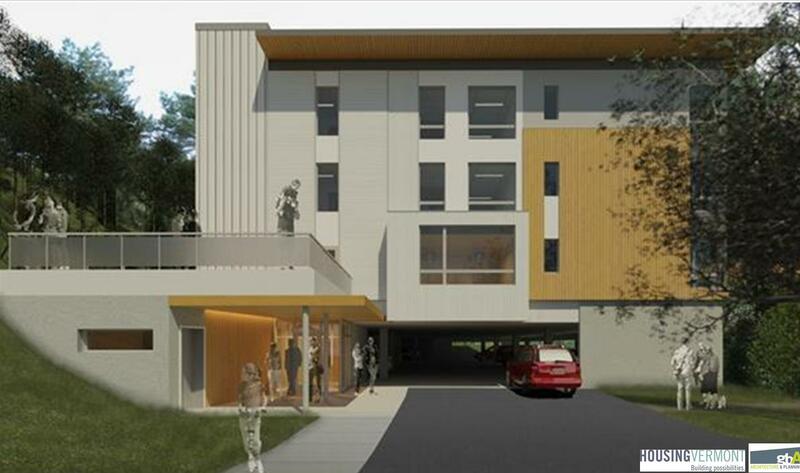 An architectural rendering of what Wentworth Community Housing will look like upon completion. Twin Pines Housing has a total of 122 units currently in development in the Upper Valley; its executive director says the deficit of units is in the thousands. And that is because of the way this project was financed. Twin Pines Housing tapped into funds from that affordable housing bond mentioned earlier. Winter says that will allow them to serve some middle-income renters who are still priced out of the Upper Valley market. The rental vacancy rate here is low — as of last fall, it was less than 2 percent. “It is really, really hard to find housing in the Upper Valley,” Winter says. Twin Pines Housing is working to address this. And when you learn about their work, and the ambitious goals for Chittenden County, and the effort the state has made to support affordable housing, you can’t really say that people aren’t trying. But is it enough? Take the Upper Valley. Twin Pines has 122 units in development for this region right now. But Winter says there’s way more demand than that. Given all this, it’s easy to see why higher-density development is such an appealing solution. And it sounds great in theory. But in practice, it can be a tough sell. “Vermont is not a very dense state. And when we encourage density it gets a lot of people nervous real quickly,” says Maura Collins of the VHFA. As for our question-asker Peter Kerson? He and his wife are looking for the best of both worlds.